With nice summer weather comes the opportunity to take the party outside! Partying outdoors is a great way to let the kids spend their excited energy, minimize the mess, and upscale the fun. 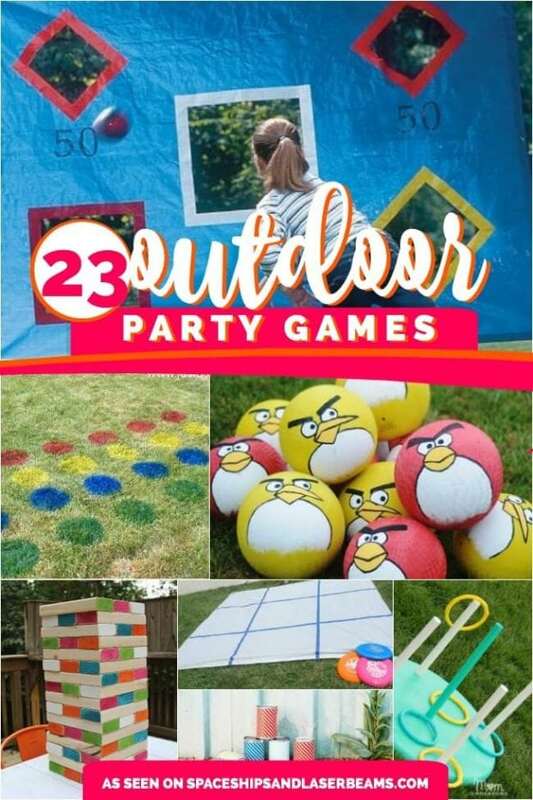 Here are our top 23 outdoor party game ideas. Don’t forget to keep sunscreen and bug spray handy! Have fun checking things off your Summer Bucket List with this free printable. Enjoy a refreshing, cool treat with these 20 Frozen Treat Recipes. Check out these DIY Board Games — your kids will love them! Get inspired with the best party games for kids as you plan your celebration. 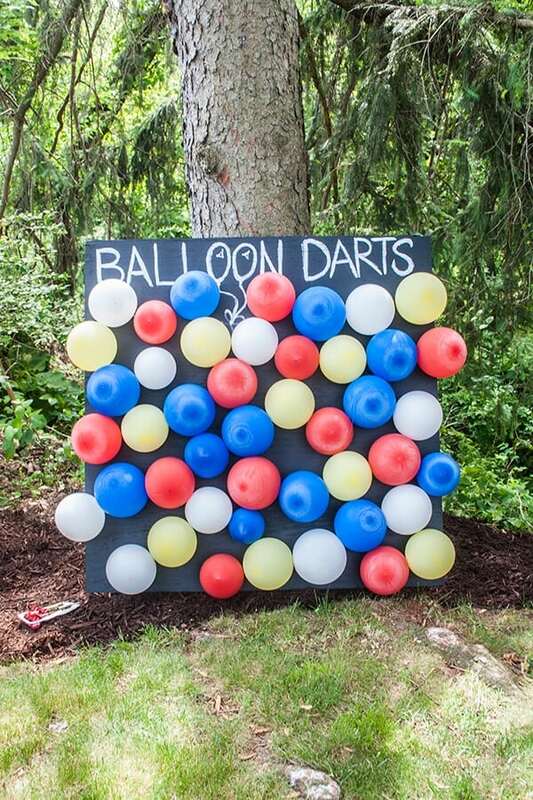 All you need for this fun twist on a classic outdoor party game is a shower curtain, duct tape and six or more flying disks/Frisbees. Many, if not all of these items can be sourced at your local dollar store, making it budget friendly. Be prepared, however, this game isn’t as easy you might think. It’s a test of accuracy and aim for sure. 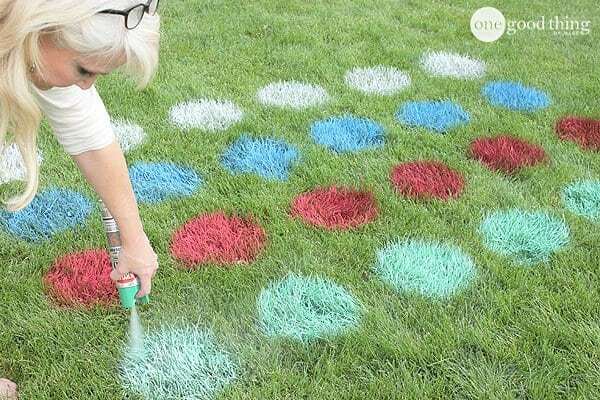 Use red, yellow, blue and green paint to create circles on your lawn for a giant outdoor Twister game. You’ll begin by making yourself a circle template from card stock or construction paper. This is easy to do by tracing the shape of a plate or big pot and cutting out the resulting circle. You’ll discard the circle and save the relief of the circle as your template for spray painting. An obstacle course makes for an awesome outdoor party game. You can recreate this obstacle course, which includes a belly crawl and tunnel craw for the kids. These two obstacles are easy DIYs using yarn or yard string, pool noodles and wooden stakes (that can easily be pounded into the ground using a rubber mallet). You can even add more obstacles such as walking a plank between two chairs, climbing over a picnic table or playground, jumping over homemade hurtles, navigating hula hoops or tires, etc. If you’ve never played giant Jenga, you’re missing out. You’ll definitely want to add this to your outdoor party game list. This game is created from 2 x 4 boards, cut into forty-eight 10 ½” pieces. You’ll need to sand each surface down to make sure everything is smooth for easy game play. You can keep the wood raw, or add some color by painting the ends of each Jenga “brick”. Always a party favorite, the silly sack race is a classic for a reason. It might be that it is so much fun and is guaranteed to bring plenty of laughs! Add felt decorations to potato sacks to match your party theme, and let the kids spend their party energy trying to race their sacks to the finish line. Add water, add fun (plus a great way to cool off on a hot day). This water relay is affordably made using a few plastic cups with small holes poked in them, an ice bucket or chest filled with water and an empty ice bucket or chest. Kids will love this relay that involves filling their hole-filled cup with water, carrying the rapidly leaking cup of water over their heads towards the empty bucket. The team or individual that fills up their empty bucket to the top with water first, wins! For this easy hula hoop toss game, you’ll need balloons, a permanent marker, hula hoops and something like a plastic fork or yard stake for attaching balloons to the ground. Simply draw numbers (25, 50, and 100, 500 or smaller for younger kids) on balloons before tying the balloons to the ground. To score points, kids toss hula hoops over the balloons. The participant with the most total points, wins! If you already have a sandbox, simply hide a few treasures or toys in the sand for kids to hunt. 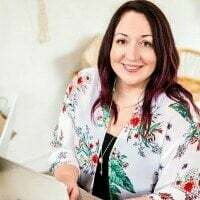 Ideas could include plastic necklaces, metal cars, toy dinosaurs, bottles of nail polish, and any other toy trinkets that match your outdoor party theme. Provide guests with a small toy shovel for digging. Guests can keep the treasure found as a party favor. If you don’t own a sandbox, you can create one by filling a big bucket or tub with sand. Every party needs balloons, and when they can serve as a party game, even better! In this great outdoor party game, kids will have fun trying to keep their own balloon safe while popping their friends’ balloons. Organizing this game is super easy, as all that is needed is balloons in a few different colors (to coordinate with the number of desired teams), air pump, curling ribbon or string, portable music player and plenty of space for game play. Kids will have fun making or chasing these giant bubbles using an awesome and easy-to-make super bubble solution. You’ll need water (distilled or regular), blue Dawn dish detergent, corn starch, baking powder and glycerin for the bubble solution. The giant bubble wand is made from wood dowels, eye screws and cotton cord (found at the fabric/sewing store). Be prepared for lots of squeals as huge bubbles delight your outdoor party crowd. Use recycled tin cans to create this fun, knock-down game to play outside with the kids. You’ll need six recycled cans, all of the same size, the free printable can wraps from Paging Supermom for decorating your cans, tape and a racquetball (painted gold in this tutorial). Adults and kids alike will enjoy competing to knock the cans down in this game! Kids love water and balloons, so put them together. If the kids are young enough that they’d get upset to have a water balloon thrown at them, have them throw the balloons at something else, such as a target or a party theme “bad guy” (e.g., the croc in Jake and the Neverland Pirates). You’ll need lots of filled water balloons, a target (*optional), and refills. 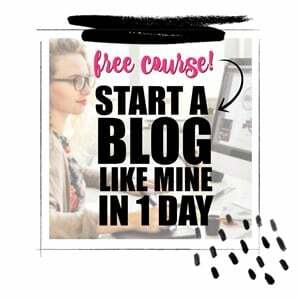 Set up a firing line and you are good to go. If warm weather is in your forecast and you have a home with young children, this backyard car wish makes for a fun outdoor party game. Bring the car wash to your backyard! You won’t be washing the family car for this activity (although that could be fun too). Instead, have your children round up their favorite toy trucks and cars! Your kids are going to love washing their favorite toy vehicles with this fun DIY activity that only requires a few simple materials. You’ll need a bowl or a bucket of water (one will work, but there is no harm in giving each child their own), wash cloths or sponges (can be cut down for smaller hands), dish soap, and drying rags. *Consider dressing your children in swim suits for this activity. This fun outdoor version of the classic Ker-Plunk game will have adults and kids challenging each other for the title of “winner”. DIYing this on a large scale level does take some time and about 11 different supplies and tools ranging from spray paint, wood boards and screws to wire and wire netting and dozens of bamboo garden stakes, plus a drill, staple gun, wire cutters and ball pit style balls. The resulting fun outdoor party game is well worth the effort. With a few basic materials, you can DIY your own passing practice game! Kids will have so much fun trying to get the football through the cut-out shapes. Assign a point value to the shapes ramps up the competitiveness. Remember how much fun you had sliding through your backyard on a wet Slip ‘N Slide? Give your kids the same fun experience without spending a fortune. You can make your own for a fraction of the cost using plastic sheeting from the home improvement store, tent stakes, and baby wash (while regular soap works, baby wash is friendlier on the eyes). Just add water and prepare for endless summer fun. This DIY ring toss game is a great game to encourage better hand-eye coordination. It’s a classic game that kids and adults love. Add it to your summer picnics, outdoor parties, family reunions and patriotic celebrations. You can DIY it yourself using one round pine panel, 2 dowels, paint, and a drill bit! The rings are made from nylon rope, #E6000 glue and duct tape. Now pool noodles can be used for more than just staying afloat in the pool. Kara shares five ways to take your boring old pool noodle and turn it into a fun activity for your kids this summer. 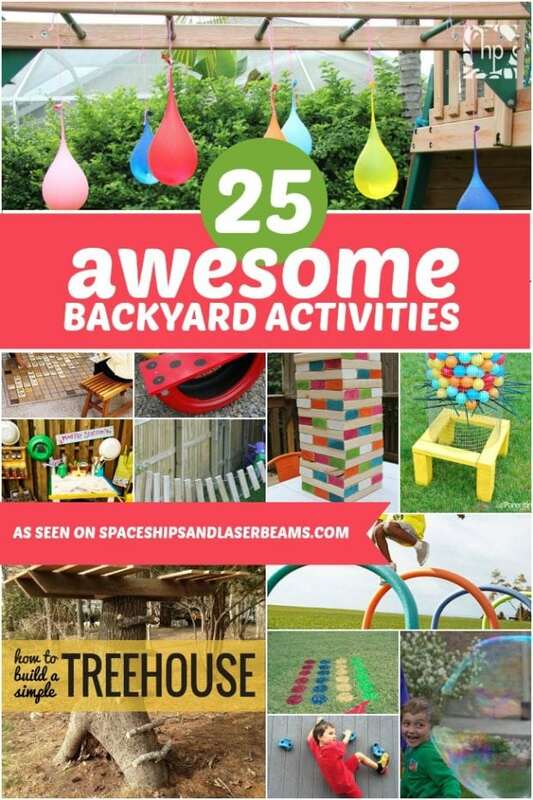 You can create a giant ring toss game, a pool noodle target station, pool noodle croquet, a giant tic-tac-toe game, or even use a pool noodle as a bat for playing water balloon baseball. Other than pool noodles, very few additional supplies are needed (duct tape and dowels are the main supplies). This great budget-friendly tutorial for a balloon dart board not only shows you how to make the board, but also how to turn it into a fun game where each kid can win a prize based on the balloon that they pop. This is easily accomplished by putting a numbered slip of paper in each balloon that corresponds with a prize. What’s even better is that there are examples on how to turn an ordinary balloon dart board into a themed holiday dart board for Halloween and Christmas. The possibilities are endless! If you’re considering bringing the carnival to your backyard this summer, you’ve got to check out all of these great outdoor carnival party games. You’ll love how manageable the DIYs are, both in skill and budget needed to make them. Take for instance the giant tic-tac-toe game, made from a dollar store shower curtain staked to the ground and a grid made from painter’s tape. A fun ring toss game features lollipops inserted vertically into a wood board, and bracelets as the ring. Successfully ring a sucker, and it’s yours to keep. Check out the toilet paper toss, pop-a-shot, frog jump, Plinko and football throw, among other fun outdoor game ideas. Ice bowling is a perfect summertime outdoor game. I love that it uses recycled bottles. Fill empty plastic beverage bottles with colored water to create bowling pins. Set the “pins” up in your backyard, and let your kids try to knock them down with a ball made from a frozen water balloon. Cool! With inexpensive water guns from the local dollar store and a few plastic cups, you’ll have a fun game that challenges your kids to knock ‘em down. If you really want to impress your guests at your next outdoor party, consider setting up your very own life-sized Angry Birds game. Regular playground balls are given an Angry Birds makeover with some paint. Moving boxes in a variety of shapes and sizes are repurposed and positioned for knocking down. Balloon pigs are made from printables attached to green balloons. A life sized sling shot is made from part of a camping chair, rubber tubing and wood. This amazing DIY is sure to be a neighborhood favorite!